UK Release Date - 5th August 1983. US Release Date - 2nd June 1983. Special Formats - Limited Edition 7 Inch Rock Box fold-out sleeve. Special Formats - Limited Edition 7 Inch Guitar Shaped Picture Disc of Phil's Ibanez Destroyer. Special Formats - 1989 CD Video single. Art Direction - Andrew Prewett. The second single from 'Pyromania' was released in May/August 1983. 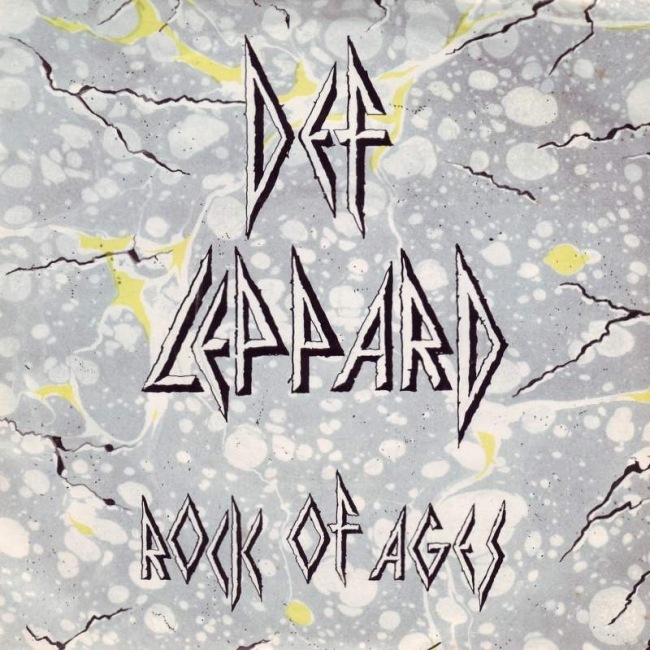 'Rock Of Ages' was the biggest hit from the album in the UK, in that it was the closest to actually being one, reaching Number 41. In the US it became the second Top 20 hit from the album, getting to number 16. Like 'Photograph' it also got to Number 1 on the Mainstream Rock Charts. The single was released in four formats in the UK. Three 7" singles and one 12". Two of the 7" singles were special Limited Editions. The first was a "Rock Box" - a cardboard sleeve that folded out into a box shape. The normal 7" VER 6 could fit inside it. The other 7" was a cut shaped picture disc of Phil Collen's Destroyer guitar. The front had the Def Leppard logo on the body of the guitar and 'Rock Of Ages' along the neck. On the back the song titles and band members names were printed in white on a black background and two promo pics. One backstage and one on stage by Ross Halfin. Five individual live band pics by Ross were used on the back of the regular 7". In other countries various unique sleeves were used. The Japanese and French editions had different live pics - both by Ross Halfin.